I took this photo from my window at work today. 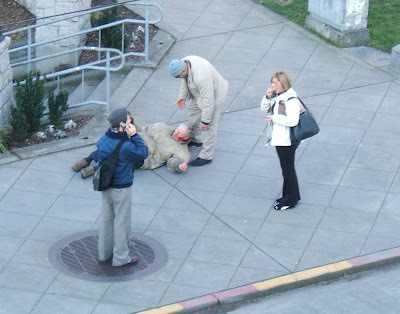 This man fell down and was bleeding. We called 911 as soon as we saw it. The guy in the blue hat is helping him, the guy on the phone is calling 911, but the woman, she is having a snack while she is watching it all go down! Some people see blood and get grossed out, some rush to help, some think, "Snack time!" The man was all right, he just had a fall and head wounds look a lot worse than they are. The fire dept came and cleaned him up and left. I hope he made it home OK. he didn't seem too steady on his feet. jeez laweez, that is funny...I love checking in on the photo of the day...great idea, and good follow through! Poor man. Hope he's ok. I can eat while watching blood,I ate popcorn while watching Sweeny Todd, but it does seem a little uncaring.